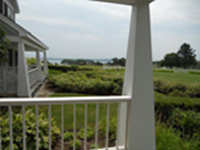 Beautiful views include the Samoset Resort Golf Course, the Village courtyard, plus the countless views of Penobscot Bay. This is the website of Sail Away Maine Realty & Property Management, Inc, ownership belongs to Sail Away Maine Realty & Property Management, Inc and it's affiliates. We do not use this website to collect any personally identifiable information about you other than what you provide voluntarily. We may use such voluntarily provided information to improve our understanding of your interests, to improve our services, or to contact you. It is our policy not to share or disclose personal information of our clientelle or contacts to third parties for the third parties' direct marketing purposes if you request that we not do so. We reserve the right to exchange project information but only with other "projects" in progress explicitly. If you do not want any personally identifiable information about yourself collected through this site, please do not provide it. At your request we will make reasonable efforts to remove any such information from our records. You may submit your request by email (info@sailawaymaine.com), by tetelphone toll free (866) 348-4006, or by mail (MIAV Solutions, ATTN: Sail Away Maine Realty, 1234 D St. NE, Washington, DC 20002). If you supply us with your postal address using our online form in the "Questions/Comment/Suggestions" area, you may receive periodic mailings from us with information on upcoming promotions, events, or specials which may be of interest to you or your business. If you do not wish to receive such mailings be sure to specify this when using our online contact form, or you may send email to us at the above address. When contacting us regarding this type of matter please provide us with your exact name, email address, and phone number. Persons who supply us with their telephone numbers online may receive telephone contact from us with information regarding requests they have made online. The Sail Away Maine Realty & Property Management, Inc's logo is a registered trademark of Sail Away Maine Realty & Property Management, Inc. Use of the name and/or the logo without written permission of the president of Sail Away Maine Realty & Property Management, Inc is prohibited. We do not use this website to collect any personally identifiable information about you other than what you provide voluntarily. We may use such voluntarily provided information to improve our understanding of your interests, to improve our services, or to contact you. It is our policy not to share or disclose personal information of our clientelle or contacts to third parties for the third parties' direct marketing purposes if you request that we not do so. We reserve the right to exchange project information but only with other "projects" in progress explicitly. If you do not want any personally identifiable information about yourself collected through this site, please do not provide it. At your request we will make reasonable efforts to remove any such information from our records. You may submit your request by email (info@miavsolutions.com), by tetelphone (207) 433-5178, or by mail (MIAV Solutions, 1234 D St. NE, Washington, DC 20002). If you supply us with your postal address using our online form in the "Questions, Comment, Suggestions" area, you may receive periodic mailings from us with information on upcoming promotions, events, or specials which may be of interest to you or your business. If you do not wish to receive such mailings be sure to specify this when using our online contact form, or you may send email or postal mail to us at the above address. When contacting us regarding this type of matter please provide us with your exact name, email address, and phone number, with the words "Mailing Removal" as your subject. You may view, download and print Sail Away Maine Realty & Property Management, Inc-originated contents from the site subject to the following conditions: (a) the content may be used solely for information purposes; and (b) the content may not be modified or altered in any way. You may not republish, distribute, prepare derivative works, or otherwise use the content other than as explicitly permitted herein. You may not frame or use framing techniques to enclose any trademark, logo, or other proprietary information (including images, text, page layout, or form) of Sail Away Maine Realty & Property Management, Inc without the express written consent of Sail Away Maine Realty & Property Management, Inc's president. You may not use any meta tags or any other "hidden text" using MIAV Solutions' or Sail Away Maine Realty & Property Management, Incs' name or trademarks without the express written consent of the president of Sail Away Maine Realty & Property Management, Inc. You may not use any Sail Away Maine Realty & Property Management, Inc logo or other proprietary graphic or trademark as part of the link without express written permission from the president of Sail Away Maine Realty & Property Management, Inc.
You do not acquire any ownership rights to any content in the site. Any unauthorized use terminates the permission or license granted by Sail Away Maine Realty & Property Management, Inc.
By submitting information, you grant Sail Away Maine Realty & Property Management, Inc a nonexclusive, royalty-free, perpetual, irrevocable, and fully sublicensable right to reproduce, use, modify, publish, adapt, translate, create derivative works from, distribute, and display such content throughout the world in any media. By submitting information you also represent and warrant that the content is accurate; you own or have permission to use the content that you submit; and that use of the content will not cause injury to any person or entity. Sail Away Maine Realty & Property Management, Inc offers products and services on the site. When you enroll to obtain a product or service fromSail Away Maine Realty & Property Management, Inc on the site, you accept the specific agreement applicable to that product or service. Your use of any such product or service offered on the site is governed by the terms and conditions in the agreement for that product or service. Except as provided in that agreement, Sail Away Maine Realty & Property Management, Inc does not warrant that any product descriptions or content contained in this website is accurate, current, reliable, complete, or error-free, thoughSail Away Maine Realty & Property Management, Inc does it's best to maintain such accuracy.